Looking back at this picture of us standing just feet away from Mia's "finding spot"...seems surreal. 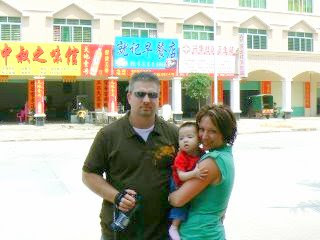 Mia was found under the blue sign behind us on the day she was born...in front of the gate to this restaurant. Who knew that day would lead her into our arms and into our hearts. I thank God for planning her destiny. These 7 cribs are where the 7 girls in our travel group spent their first 8 months of life. Mia McMath, Faith Rathjen, Kylee Oswald, Jessni , Annie Copeland, Jenna Holcomb, and Maddie Cardwell. Here we are...the McMath's. Mia will never again see this orphanage unless we CHOOSE to visit here later in life. She is ours forever.